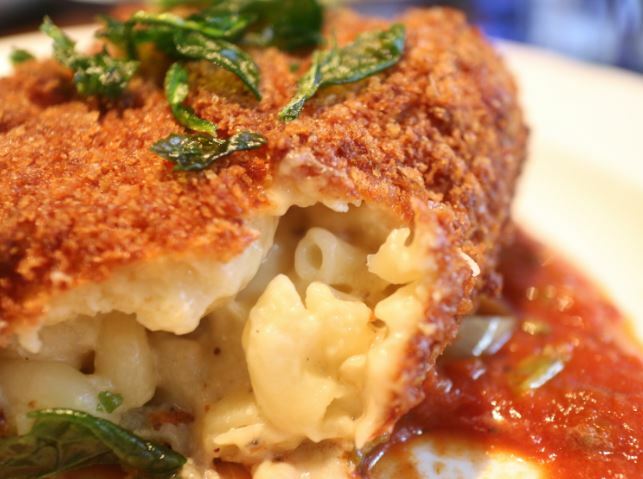 Macaroni fritters: OH MY!!! Essentially, these are balls of macaroni cheese, deep fried. A bit of a treat, wouldn’t you agree. 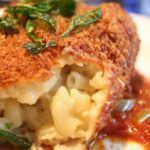 Macaroni cheese is possibly the most popular pasta dish in America and although it may seem impossible to imagine, there seem to be hundreds of different versions of it. This particular recipe requires some patience because like any good, baked pasta dish, it’s always better the next day. You will need to leave your macaroni cheese overnight in the fridge to allow all those flavours to develop more deeply. As a tip, should you ever have any leftover macaroni cheese, simply follow the recipe for macaroni fritters! Make a béchamel: Melt the butter in a small saucepan, then off the heat, use a fork to stir in tablespoons of the flour until smooth. Return to the heat and cook for a minute until golden, then slowly add the milk, stirring a few minutes until thick. Stir in the nutmeg and season with salt and white pepper. Boil the cauliflower in a pot of salted water until very soft, about 10 minutes, and remove to a food processor with a slotted spoon. Puree the cauliflower with the béchamel, Parmesan and provolone cheese until it resembles cooked oatmeal. Place the mixture in a large mixing bowl. Meanwhile, break the pasta in half and cook in boiling salted water for 3 minutes less than package directions. Drain and stir into the cauliflower mixture. Taste and add more cheese or other seasonings, if needed. Lightly butter an 8-inch round high-sided pan and spread with the pasta mixture, packing it down firmly. The mixture should be about 2 1/2 inches high. Cover the pan with plastic wrap and refrigerate for 6 hours or overnight. Combine remaining 2 tablespoons flour with 4 tablespoons of water in a bowl to form a smooth slurry. Spread the bread crumbs onto a plate. Using a 2-inch cookie-cutter, cut out rounds from the cold pasta. Gather up any odd bits of pasta and form into another round; you’ll get about 12 rounds. Dip each round into the flour-water mixture, then into the bread crumbs, coating all sides. Heat 2 tablespoons of vegetable oil in a small skillet over high heat. Add the rounds and fry until dark golden on both sides. Drain on paper towel-lined plate. Serve at room temperature.